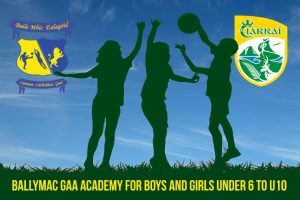 Ballymac GAA Academy for Boys and Girls U6s, U8s and U10s. Boys & Girls at U8s and U10s at 11am on our main pitch. We look forward to meeting you all again. We also have teams at u12s, U14s and u16s. Please check our website and facebook page for training times and day’s of training. All club membership is payed on line, This can be done through our website by clicking here now and it can also be done by downloading the the app my club finances.